Oraby Mediterranean Grill & Hookah Cafe Presents Hookah Night! Mondays and Wednesdays by showing this post. 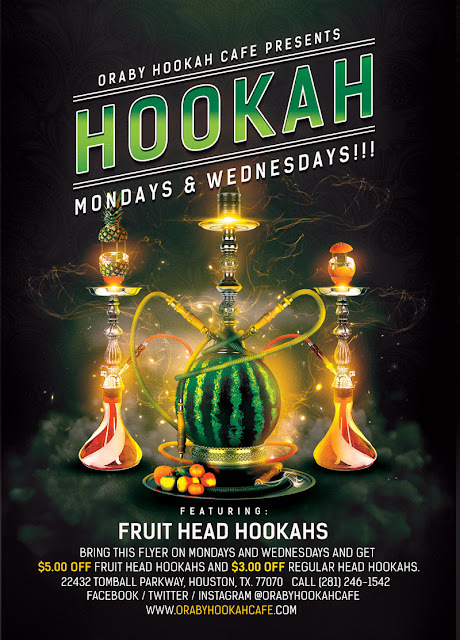 Oraby Hookah Cafe Presents Hookah Monday & Wednesdays!!! Featuring our Exotic Fruit Head Hookahs! and $3.00 Off regular head hookahs. Restaurant Hours: Sun - Thurs. 11am - 1am, Fri. - Sat. 11am - 2am. We are located at 22432 Tomball parkway, houston, tx. 77070. Call (281) 246-1542 for more information. 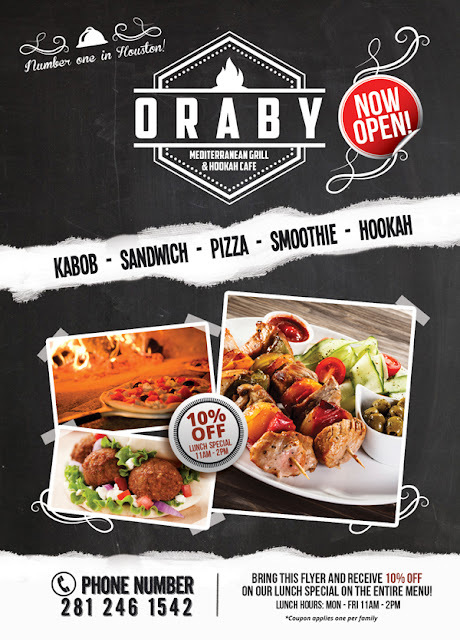 Oraby Mediterranean Restaurant & Hookah Cafe is NOW OPEN! Please join us at 22432 Tomball Parkway, Houston, Texas 77070 and visit us at www.orabyhookahcafe.com. Show this Flyer and receive 10% OFF on our Lunch Special on the Entire Menu! Lunch Hours: Mon - Fri 11am - 2pm. *Coupon applies one per family.